The Portaria Nº 72/2008 de 23 de Janeiro defines 4 types of salt destinated to alimentation, considerating its origin. The salt extrated in these salt-mash is legally considered sal de fonte salina, meaning that the salt is obtained by subterranean salty water evaporation, in consequence of sun and wind actions, previously distribuited in tradicional basins, and with manual extration. After water evaporation, and salt pyramids elaboration for salt drying, the product is taken to the elevator in order to be transported to the cooperative society. In the warehouse the salt is weighed and packed in 25 kg bags. Three types of products are available: Nature salt, Grinded salt and Manually selected salt. This last one is grinded and strictly selected, resulting in a high quality product. These products are used in different areas such as industry (animal food, animal skin transformation, textil production, bread production, refrigerants and detergents), restaurants, water treatment (pools), among others. 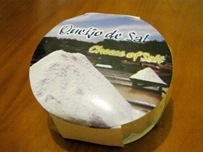 Tradiotional product which the salt is packed in a cheese form. The salt quality is a priority to this cooperative society. Therefore, a HACCP plan is being implemented since March of 2007 (see certificate). Internal Procedures: Self-control based on HACCP fundaments.